Haus am Lützowplatz (HaL) is an exhibition and event space under the direction of the art association „Haus am Lützowplatz – Fördererkreis Kulturzentrum Berlin e.V.“, founded in 1960. It was formed in the trying times of the cold war, a year before the wall was built in West Berlin, with the aim of reviving an existing cultural center at Lützowplatz. The founding members were personalities from the Berlin SPD, from the worker unions and from the Berlin cultural scene. In alignment with the promotional, informational and educational aims of the association statutes, the main focus lies on the presentation of contemporary visual arts, in connection with political and societal reality. 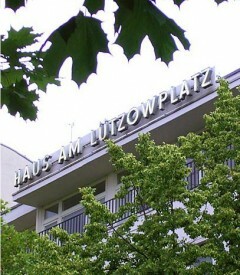 Haus am Lützowplatz (HaL) is the place for value debates and critically reflected reality.